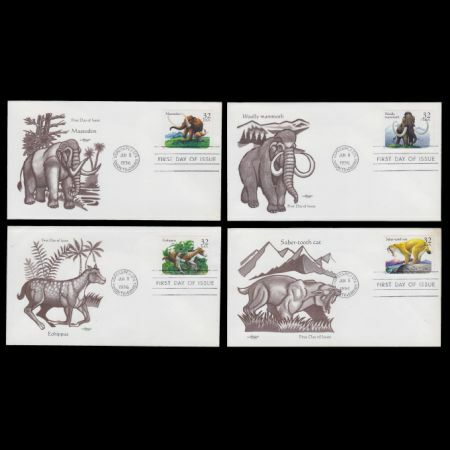 With the issuance of these stamps, the public discovered four prehistoric creatures the Eohippus, Woolly mammoth, Mastodon, and Saber-tooth cat. 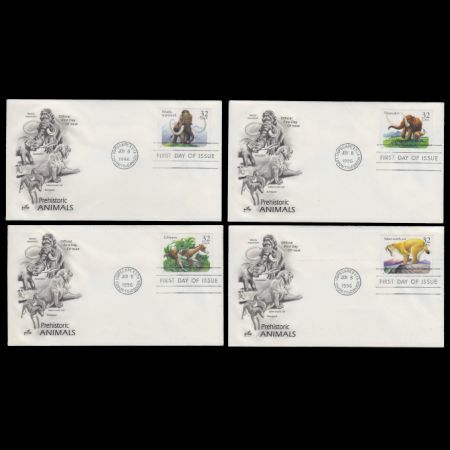 Scheduled to be released in 1995, these stamps were put on hold until 1996 due to technical problems in the printing process. 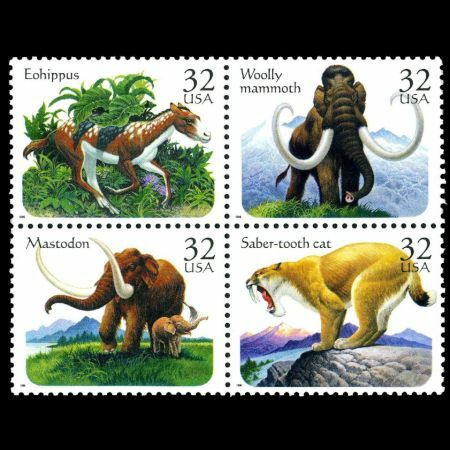 According to Stampedout web site: Eohippus should be Hyracotherium, Woolly mammoth is Mammuthus imperator, Mastodon should be Mammut, Saber-tooth cat is Smilodon. Eohippus was a small, plant-eating mammal that lived approximately 55 million years ago. Scientists have determined this animal was the horses first ancestor. Often referred to as the dawn horse, Eohippus stood about 15 inches high, and was about the size of a fox. In fact, the dawn horse closely resembled a dog-like creature, as it lacked the straight back and long face of modern horses. The Eohippus had four toes on its front foot (one of these was non-functional), and three on its hind foot. Each toe ended in a separate hoof. The part of the foot which bore the animals weight was covered with a tough pad, much like a dogs. Scientists have determined from fossilized teeth that Eohippus was more of a browser than a grazer which means it ate more like a rabbit than a horse. 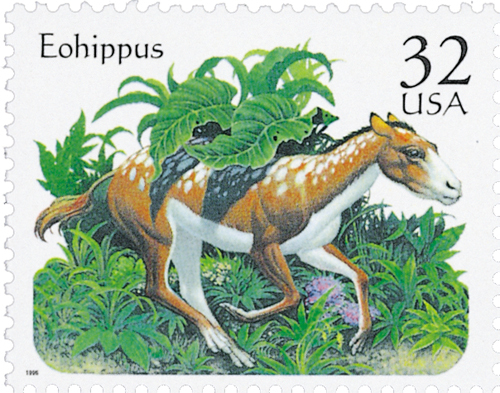 But, like todays horse, the Eohippus depended on its speed to evade predators. Nature began replacing Eohippus with a more horse-like animal, the Mesohippus or middle horse, about 35 million years ago. Twenty-six million years ago Merychippus (cud-chewing horse) emerged. It had three toes on each foot, but the strong, large-hoofed center toe bore all the animals weight. 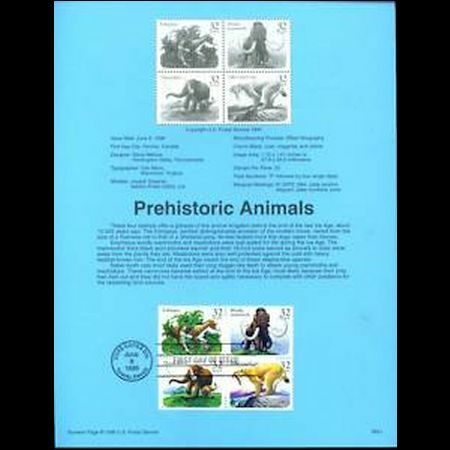 Animals resembling todays horse appeared about 3 million years ago. 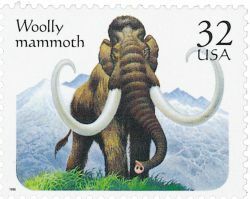 Mammoths are members of an extinct genus of elephants. 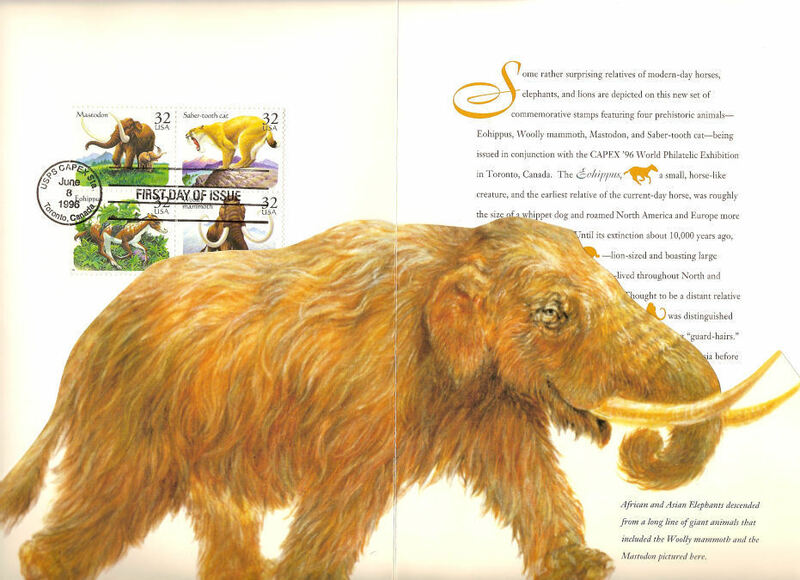 Woolly mammoths were a specialized type of mammoth with long, reddish brown hair, which protected them from the severe cold of the Ice Age (2,000,000-10,000 years ago). Mammoths were more closely related to elephants than were mastodons. 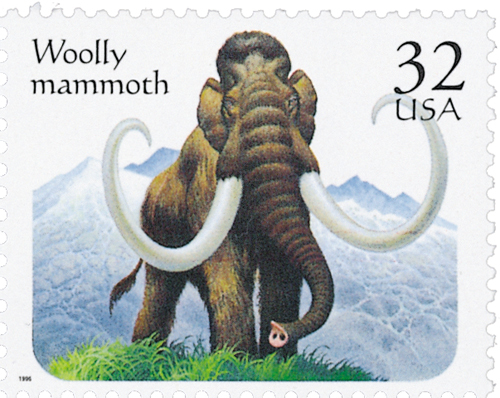 Measuring 14 feet high at the shoulder, the woolly mammoth was a huge, lumbering animal. Its tusks, which curved up and crossed in front of its trunk, could measure up to 13 feet in length. Three inches of fat under the skin provided further insulation, and there was a large hump of fat on its back. The mammoths skull was high and dome-like, and its ears were smaller than an elephants. Mammoths first appeared in Africa 4 million years ago, and they reached North America about 1.5 million years ago. 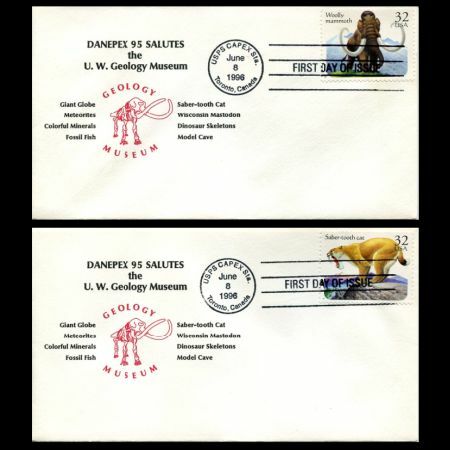 Their fossils are among the most common in the world. Remarkably preserved 30,000-year-old mammoths have been found in Siberia. Prehistoric man pictured mammoths in his cave art. 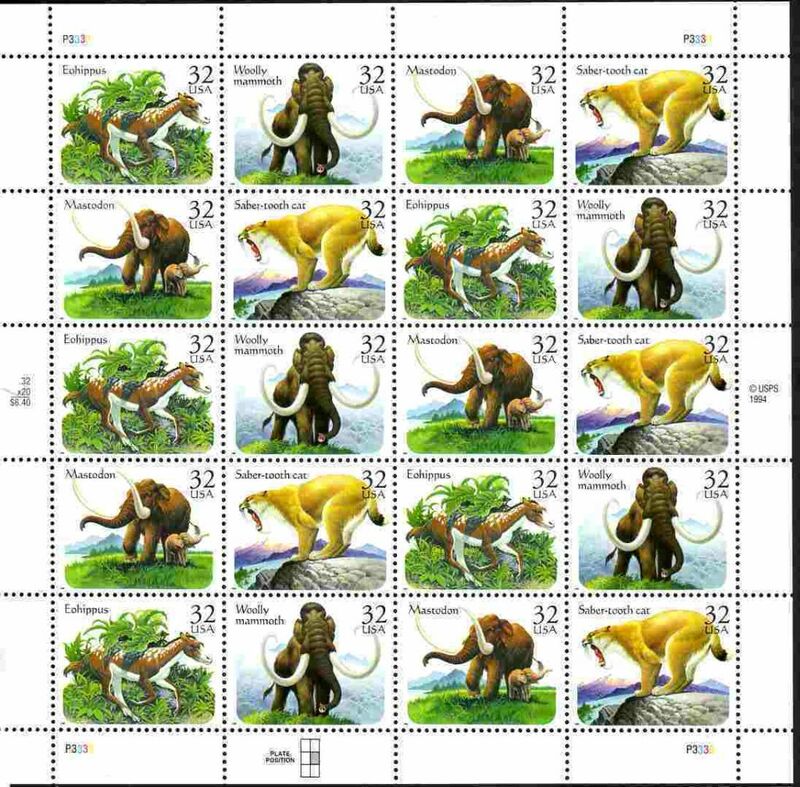 In Europe, realistic depictions of entire herds of mammoths have been found. Evidence exists that prehistoric human settlers of North America hunted these huge animals. 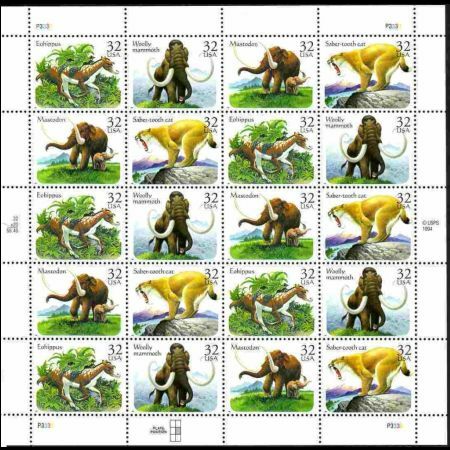 Mammoths became extinct at the end of the Ice Age. Mastodons were animals very much like modern elephants. The fossil record shows that mastodons first appeared in northern Africa about 40 million years ago. From there they spread all over Europe, Asia, and the rest of Africa. 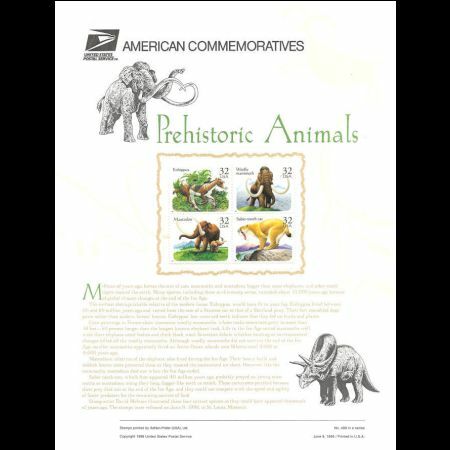 Approximately 14 million years ago, mastodons arrived in the New World. 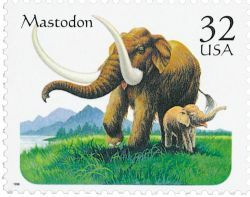 Mastodons were related to another extinct, elephant-like species, the four-tuskers. Both of these creatures were shorter and stockier than modern elephants. Like four-tuskers, early types of mastodons had tusks on both their lower and upper jaw, but many later examples of the species no longer had this trait. 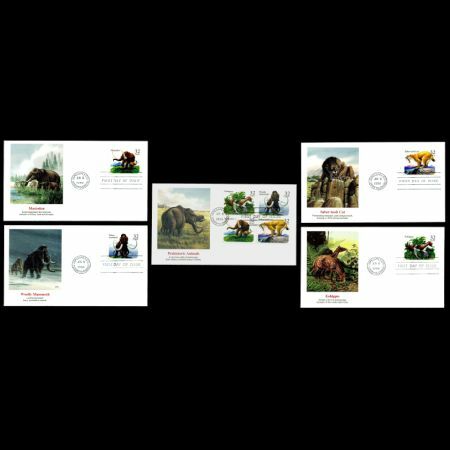 Some types of mastodons and four-tuskers had prominent lower tusks which were very flat. These animals are called shovel-tuskers. All mastodons were covered with reddish brown hair, and had teeth that were much smaller and more primitive than those of elephants. By 10,000 years ago, at the end of the Pleistocene Epoch, most mastodons had disappeared. 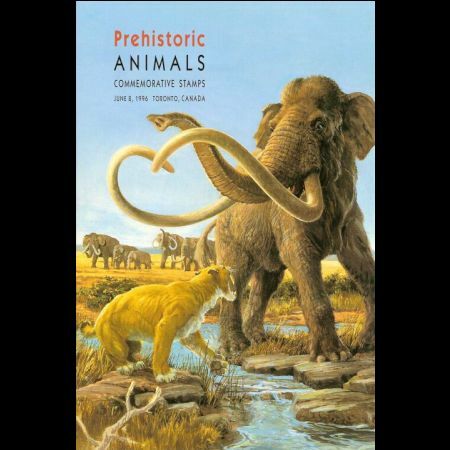 However, evidence indicates that the mastodon existed in North America after the Pleistocene which means they would have co-existed with historic Native American groups. Mankind was probably a factor in the mastodons extinction, especially in North America. The saber-tooth cat of prehistoric times is classified in a subfamily of the cat family (Felidae) called Machairodontinae. Saber-tooth cats were named for their large upper canine teeth. These teeth were curved like sabers, and could be up to eight inches long! The saber-tooth cats had very strong necks and skulls, their lower canines were relatively small in size, and their mouths could be opened to a 90 degree angle. All of these features suggest the saber-tooth cat used its canine teeth for stabbing and slashing its prey. About 2 million years ago, during the Pleistocene Epoch, the most famous of the saber-tooth cats, the Smilodon, appeared. This animal represented the peak of saber-tooth evolution. It was approximately the same size as a tiger, but stockier and with shorter limbs. Smilodon roamed all over North and South America hunting large plant-eaters such as mammoths. Many Smilodon bones have been preserved in the tar pits of Rancho La Brea in Los Angeles, California. The saber-tooth cats became extinct approximately 10,000 years ago. During that time the last glaciers retreated north. 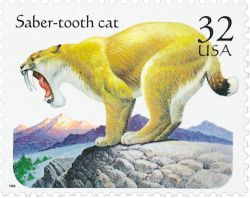 The changing climate, the subsequent changes in plants, and the success of man were probably responsible for the demise of the saber-tooth cat.